OK, so I'm taking back the comment I made yesterday about the Oregon Shakespeare Festival's Shakespeare productions as being sub par. After witnessing director Laird Williamson's gob smacking version of Romeo and Juliet, I am feeling very much in the wrong for having said that people might come away from OSF not liking Shakespeare very much. For while it's true I've seen a couple of unappetizing productions of plays by the Bard during this visit and have conversely very much liked two of the non-Shakespeare shows, seeing R & J has made up for all the negativity I felt about OSF Shakespeare this week. Set in 19th century California and capturing the wars between two opposing Mexican factions, Williamson's production highlights the rifts that separate two groups of people who are in essence the same. Nothing -- not even the usual codified costuming -- separates the Montague and Capulet families in this production except their pure hatred of one another. The similarities in the way the characters carry themselves, dress and converse render the feud between their families all the more absurd and the ensuing story of the star-crossed lovers more tragic. But what's chiefly astounding about this production is the brilliance of the performances. The casting team at OSF are doing a miraculous job of getting the right people for the right parts this year. 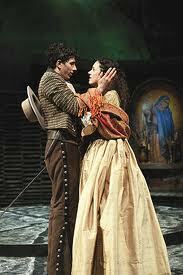 And the pairing of Alejandra Escalante as Juliet and Daniel Jose Molina as Romeo is perfect. The actors are very young -- I'm guessing they only recently stepped out of MFA programs -- and possess a command of the language and their characters that is all-consuming. And the passion between them is tender, physical, rambunctious and all consuming. In the balcony scene (probably the best staging of this famous set piece I've ever seen) Romeo and Juliet are separated by a a vast distance of space. To reach his lady love, Romeo must leap and bound all over Michael Ganio's impenetrable-looking high-walled set. Even at a distance, we can feel their excitement at each others' presence. The chemistry is complete and it remains so to the very end. Less intoxicating, but still quite fun, was the final production of this year's trip to Ashland -- Jessica Thebus' take on As You Like It. Thebus' conception of the play is whimsical and largely positive, with actors dressed up as sheep and goats bounding about the stage, and a quartet of actresses representing the four seasons dressed in architectural white gowns topped with ceremonial headdresses appearing from windows above the outdoor theatre every now and again to sing songs and wave paper butterflies around. While the chemistry between Wayne T Carr's Orlando and Erica Sullivan's Rosalind isn't quite as complete as that of the couple in Williamson's production of Romeo and Juliet, I appreciated some of the performances. Kathryn Meisle, as a spunky, crimson coat-clad Jacques provided a particularly wonderful take on her role. Though it isn't politically correct of me to say this, I can't help but question the decision to cast the deaf actor of Howie Seago in the role of Duke Senior. I had a similar issue with the casting of this actor in Henry V.
Seago gives a nuanced physical performance. But the sign language that passes between several of the characters in his scenes coupled with the necessary verbal translation of the signing by a couple of the actors is pretty distracting and hard to justify in terms of the director's reading of the play. I applaud OSF's adventurous, out-of-the-box approach to casting. But I wonder, in similar situations as they arise in the future, whether there might be a way to make the presence of deaf actors on stage more germane and organic to the rest of the physical and verbal action? Finally, I'd like to say a big thank you to Bill Rauch and Amy Richard for hosting me this year. I look forward to many more visits to Ashland and responses to the work in the future.